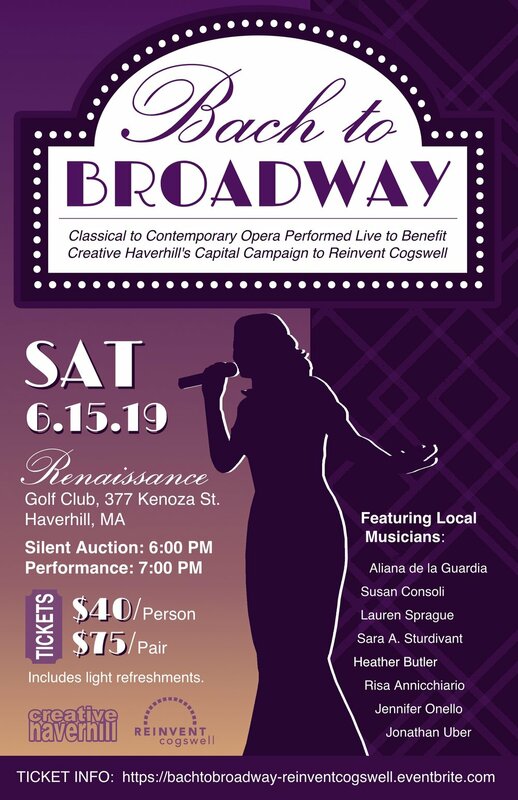 Classical to contemporary Opera performed live to benefit Creative Haverhill's Capital Campaign to turn the old Cogswell School into a Community Art Space! Enjoy light refreshments and a silent auction from 6:00pm - 7:00pm, and a wide range of opera music spanning from classical favorites to contemporary hits from 7:00pm - 8:30pm. Featured musicians include: Aliana de la Guardia, Susan Consoli, Lauren Sprague, Sara A. Sturdivant, Heather Butler, Risa Annicchiario, Jennifer Onello, and Jonathan Uber. Enjoy an entertaining evening and help Creative Haverhill preserve a beautiful and historic building for the Haverhill community!